Bombs killed more than 60 people and wounded more than 200 in Baghdad and the northern oil center of Kirkuk — a dramatic escalation of violence as U.S. and Iraqi forces crack down on Iraq's most feared Shiite militia. Prime Minister Nouri al-Maliki left Sunday for talks in Washington this week with U.S. President George W. Bush to discuss sectarian violence, which has risen sharply since Iraq's national unity government took office two months ago. A suicide driver detonated a minivan at the entrance to a bustling market in Sadr City, the capital's biggest Shiite district and stronghold of radical cleric Muqtada al-Sadr and his Mahdi Army militia. At least 34 people were killed and 74 were wounded, the Iraqi army said in a statement. Eight more people died and about 20 were injured when a roadside bomb exploded two hours later at a municipal building in Sadr City about a half mile from the car bombing, the army said. In Kirkuk, 180 miles to the north, a car bomb detonated at midday near a courthouse. The courthouse is located among a cluster of wooden shops and stalls, many of which burst into flames, engulfing the warren of crowded streets in roiling black smoke. Twenty people were killed and 159 were wounded, police said. The tally of injured was so high because many people were trampled as panic swept shoppers, police said. Others suffered burns when the initial blast triggered secondary explosions in shops that sold chemicals and flammable liquids, police said. Scenes at local hospitals were gruesome. Victims young and old lay bleeding on stretchers and gurneys, some of them scarred with horrific burns. Many lay unattended as doctors and nurses scrambled to care for the large number of wounded. Also Sunday, the U.S. military announced that an American soldier assigned to the 1st Armored Division was killed the day before in Anbar province, a bastion of the Sunni-dominated insurgency. Four U.S. soldiers accused of murdering suspected insurgents during a raid in Iraq said they were under orders to "kill all military age males," according to sworn statements obtained by The Associated Press. The soldiers first took some of the men into custody because they were using two women and a toddler as human shields. They shot three of the men after the women and child were safe and say the men attacked them. Saddam Hussein was hospitalized Sunday on the 17th day of a hunger strike started to protest courtroom procedures and the killings of defense lawyers, the chief prosecutor in his trial said. In the northern city of Mosul, gunmen attacked a joint U.S.-Iraqi base with rocket-propelled grenades and mortar fire. A suicide car bombing followed, but nobody was hurt, said police Lt. Col. Abdul-Karim Khalaf. One civilian was killed in the crossfire when masked gunmen attacked Iraqi police in Mosul, and three gunmen died in a separate firefight with police there, Khalaf said. A curfew was imposed on Samarra after a bodyguard of the city council chairman detonated an explosives belt, injuring the chairman and another security officer. Baghdad recorded an average of 34 major bombings and shootings for the week ending July 13, the U.S. military said. That was up 40 percent from the previous period last month. Much of the violence was due to sectarian attacks. It was the fourth car bombing this month in Kirkuk, the center of Iraq's vast northern oil fields. Tensions have been rising in Kirkuk because the area's Arabs, Kurds and Turkomen all have rival claims to the region. The Sadr City car bombing was the second major suicide attack this month in the teeming slum district, where al-Sadr's Mahdi militiamen rule the streets. 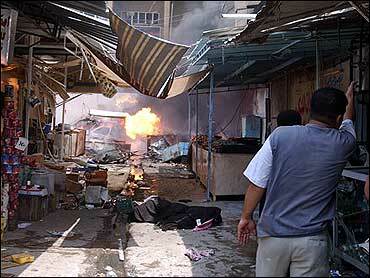 A July 1 suicide bombing in Sadr City was followed by a wave of reprisal killings of Sunnis. Many Sunni politicians hold the Mahdi Army responsible for the wave of attacks against Sunnis that followed the Feb. 22 bombing at a Shiite shrine in Samarra. Al-Sadr's aides deny that the militia is doing any more than protecting Shiites from attacks by Sunni extremists including al Qaeda in Iraq. So feared is the militia among Sunnis that many of them refer to any band of armed, masked Shiites as the Mahdi Army. Hours before the Sunday blast, Iraqi troops and U.S. advisers launched raids in Sadr City and the mostly Shiite district of Shula, searching for suspected members of sectarian death squads, a U.S. statement said. Two hostages were freed in the Sadr City raid, and two people were arrested in Shula, U.S. and Iraqi officials said. U.S. officials made no mention of al-Sadr or the Mahdi Army in statements about the raids. "We are not concerned with whom they are affiliated. We are only concerned with taking people responsible for these illegal acts off the streets and will continue to do so aggressively," U.S. military spokesman Lt. Col. Barry Johnson said. However, it was clear that the U.S.-led coalition is stepping up pressure against the Shiite militia in a bid to reduce sectarian violence, which U.S. officials now consider a greater threat than the Sunni-led insurgency. Last week, British troops arrested the commander of Mahdi Army forces in Basra, Iraq's second-largest city. On Saturday, U.S. and Iraqi troops killed 15 fighters in a three-hour gunbattle around al-Sadr's office in Musayyib, 40 miles south of Baghdad. One Iraqi soldier was killed, the U.S. said. Local officials also said U.S. and Iraqi troops Saturday raided al-Sadr's office in Mahmoudiya, scene of reprisal killings since suspected Sunni gunmen killed 50 people, mostly Shiites, in a raid last week on a market. In Najaf, a senior al-Sadr lieutenant claimed the Americans want to crush the radical cleric's movement because he is the most prominent Shiite leader to oppose the U.S. military presence. "We are the only group that rejects the occupation because we are nationalists," said Jalil al-Nouri. "We are the only political group that rejects their presence in the country and we demand that they leave. We are to the point, and we are clear." Al-Sadr, scion of one of Shiite Islam's most prominent clerical families, led two uprisings against the Americans in 2004. The U.S. stopped short of capturing him under pressure from the Shiite clerical hierarchy. After a cease-fire, al-Sadr has emerged as a major political force. He controls a movement modeled after Hezbollah in Lebanon, running charities, clinics — and an armed militia. Al-Sadr's followers hold 30 of the 275 seats in parliament and control five Cabinet ministries including health, transportation and agriculture. Although al-Maliki has pledged to disband the militias, he relies on al-Sadr for political support. The prime minister's Dawa party was founded by al-Sadr's father-in-law, who was executed under Saddam Hussein.